Tie-Dyed Vanilla Cupcakes with French Vanilla Frosting | What Smells So Good? It was my birthday this past Monday (PS - thanks everyone for the Facebook b-day wishes! ), and to celebrate with my Grade 1, 2 and 3 Home Ec classes I busted out what is now becoming more or less "tradition" - cupcake decorating! To simplify matters (mostly because I don't have an oven, or much of a counter, at easy disposal) I bake the cupcakes at home and bring them "naked" to class with a bucket of "base frosting" (AKA vanilla buttercream) and some Ziploc "piping bags" of decorating frosting. I usually stick with vanilla-based flavours rather than chocolate, since enough of the kids are anti chocolate (horrors, I know) that it's not worth fighting about it. That doesn't mean I can't have fun with them, though! 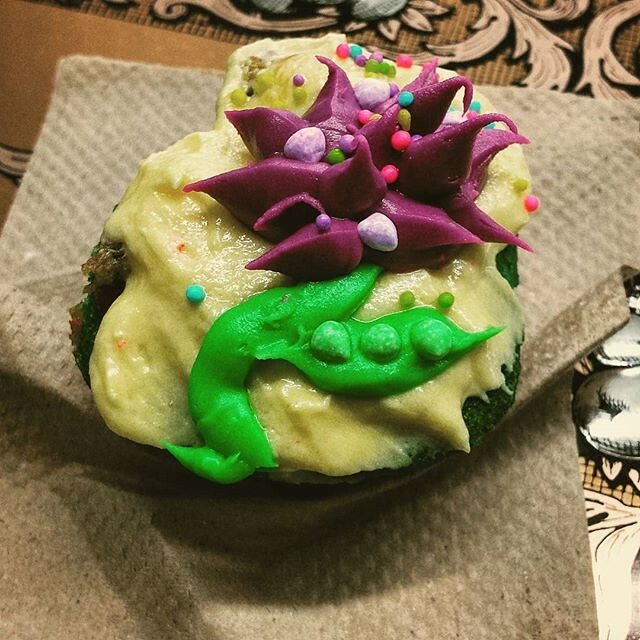 This year I busted out one of my childhood favourites, the "Tie-Dye Cupcake", which quickly became the hit of the class. The basic recipe is simple - almost ridiculously so - and I easily veganized it by swapping the dairy milk out for a boxed coconut beverage. Not only did the coconut milk add a touch of extra rich, sweet flavour, but it kept the cakes incredibly moist and tender. A little whole wheat pastry flour and a whisper of nutmeg added a little complexity to the vanilla base and appealed to both grown ups and kids, even if they didn't know it was there! Of course, the colours have no flavour, but they did make the whole lesson festive and way too much fun - especially when the kids ate theirs (topped with loads of coloured frosting too, of course) and compared their "tie dyed tongues"! Going with the vanilla theme, I decided to make a rich, French vanilla frosting as my "base buttercream". To the drop-dead simple icing sugar - shortening - "butter" mix, I added a scoop of vanilla custard powder and another touch of nutmeg which not only added great flavour but helped to stabilize the blend enough to spread without adding a bucket of sugar (I hate frosting that tastes of just powdered sugar!). That said, it is still very much a "keep refrigerated" item - the vegan butter softens faster than "regular" butter so if you want to keep things solid, cool is best! Makes 12 - This recipe doubles well but I don't recommend expanding it further. Preheat your oven for 350 F. Line a cupcake pan with 12 paper liners. In a big bowl, beat together the milk, oil, vinegar and vanilla. Whisk in the flours, sugar, baking soda and salt just until the batter just comes together. Split the batter from one large bowl into 3 smaller bowls. Add 4-5 drops of your chosen food colouring to each bowl and stir in until well blended. 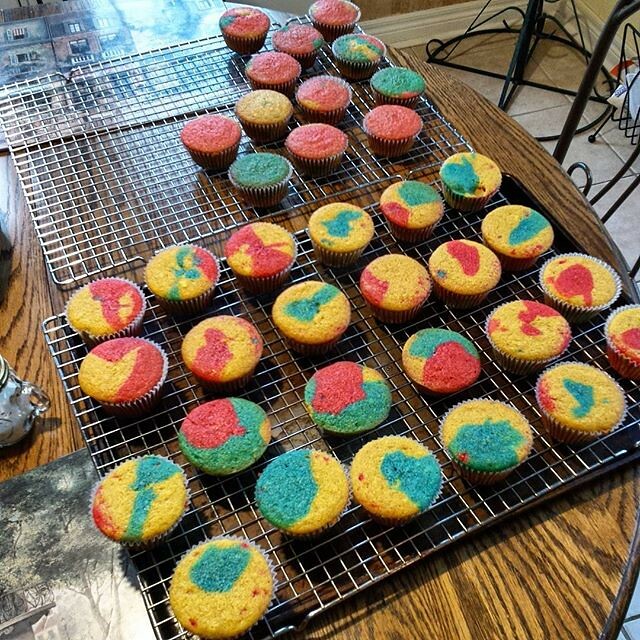 Drop spoonfuls of each colour batter into the cupcake liners, filling the cups ⅔ of the way full. Bake 18-20 minutes, until the tops are slightly golden and a cake tester comes out clean. Wait until the cupcakes are cooled completely before frosting. N.B. : Depending on your preference, you can cut the sugar to 2/3 or even 1/2 cup - especially if using a large amount of frosting! Many of my kids (who made "frosting mountains" rivaling the one on the left here) told me the cupcakes were "too sweet", however the adults (who are more modestly frosted ones) found the balance perfect, especially after chilling. Mix all the ingredients together with a hand mixer until creamy. Chill 1 hour before using.